Set in the fictional realm of Deltora, a land not unlike that of Middle Earth, Deltora Quest follows the Frodo-esque attempts of Leif, a humble blacksmith’s son, to locate seven fabled gems and restore them to their rightful place within the magic Belt of Deltora (‘One belt to rule them all’). This will end the tyranny of the evil Shadow Lord, who resides on Dread Mountain, and allow the rightful ruler of Deltora to take their place on the throne. 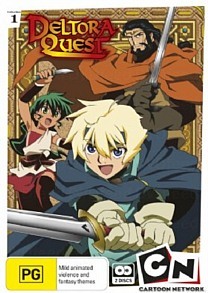 Based on the million-selling series of children’s fantasy books written by Australian Emily Rodda, the anime version of Rodda’s tale makes such a laughably cursory attempt to disguise the parallels with Lord of the Rings that it’s astonishing the tetchy Tolkien clan hasn’t come a–knocking, lawyers in tow. Dark Lord/Shadow Lord, Mount Doom/Dread Mountain – Deltora’s Shadow Lord even takes the form of a giant flaming eye. Before he sets out on his quest Lief is adorned with a magical sword and a cloak of invisibility, and is joined on the journey by his trusted companion Samwise, I mean Barda, and the mysterious Jasmine, who has the ability to communicate with trees. At one point in the final episode Jasmine laments ‘It just feels like this flatland goes on forever.’ I initially thought she said ‘It feels like this plotline goes on forever,’ and by that point I couldn’t have agreed more. Derivative, flashy but ultimately empty, Deltora Quest has some enjoyable moments, but it’s nothing Tolkien didn’t do infinitely better half a century ago. Another big oversight is the lack of Japanese audio. I know the source material is Western, but so what? It wouldn’t break the bank to include two audio tracks, and though the voicework is decent enough an English two-channel audio track is hardly the ideal way to experience an anime series. On a more positive note the animation is excellent. Character designs are nicely varied, backgrounds are lush and the attention to detail impressive. Aside from some oddly jittery motion sequences, visually the series can’t be faulted. A smattering of trailers for other animated fare such as Ben 10 and Foster’s Home for Imaginary Friends.